What will happen if the Blue Lanterns fall? Will the Red Lanterns host a gala ball? Or maybe they'll just appear mean? And just let off some steam. By going down the local shopping mall. Well, it's either that, or visit Writer: Tony Bedard; Artist: Tomas Giorello; and Publisher: DC Comics in May 2012. Who wants some coupons? In many ways this issue of New Guardians, entitled 'Beyond Hope', reminds me of when I saw a Nun get pi*ssed at my local pub. Part of me was bemused by this sight, while the other part of me wanted to see a lot more. Well, the planet Odym in deep outer space is currently being attacked by a galactic fleet called the Reach. Now in defiance of this act, the local inhabitants of this rustic world, the Blue Lantern Corps, are trying their best to fight back against these despots any which way they can. Moreover, battling by their side is none other than Green Lantern Kyle Rayner, Star Sapphire Fatality, Sinestro Corps member Arkillo, and the Weaponeer from Qward. Sound like a pretty hectic kafuffle, doesn't it? Let's hope that the good guys don't lose. Oops! To be continued when everybody fly's off to kick the living sh*t out of Lafleeze. KANJI-KAI: I always wanted to kill a love lantern. KANJI-LA: What type of weapon is love supposed to be anyway? FATALITY: Clearly you've never had a girl friend. Ha! Trust a woman to put it in very clear terms. Plus trust a man to use the phrase 'love lantern'. Well, I think Kanji-Kai is a man anyway. The one key factor that made this issue a very nice read was the way that the 'New Guardians' are clicking as a team. Honestly, the emotion each member exhumes at times is rather strange to comprehend. Part of me is even wondering how writer, Tony Bedard, is doing this without seeming to try. I am afraid to say that the worst thing about this tale was the predictability to it. Even if you are the type of a person like I am, who has managed to avoid reading any advanced listings, you could tell within the very first couple of pages or so how this story was going to resolve itself. Maybe this has something to do with how the rest of the Green Lantern line is bumping off the rest of the coloured Corps? Huh? STORY: If truth be told there wasn't anything that overtly creative in this tale really; except for the fact that we got to see Saint Walker pissed off (which was a turn up for the books). 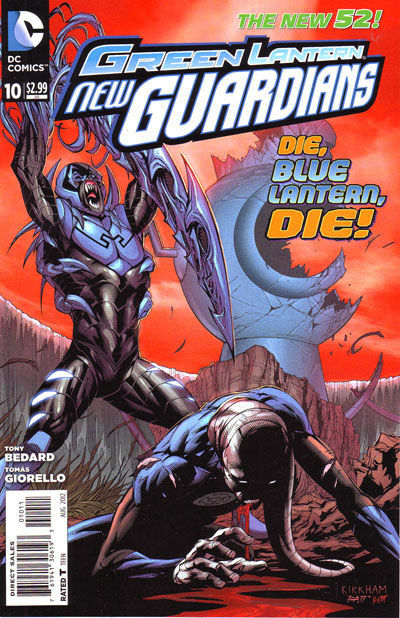 Plus I did like the idea of the Blue Lanterns Corps wandering the galaxy in search for someplace to stay. ART: If regular artist, Tyler Kirkham, should ever decide to bugger off to another title, I hope that the chap who took over from him in this issue, Tomas Giorello, would step into his shoes. Well, not only does he have a very similar style than Tyler's, but he also has a great way of illustrating expression in characters faces. Very bold. KANJI-LA: ... Bud Abbott. Two very diverse characters. Playing opposite yet in harmony at the same time. Just like these two aliens, huh? But without the heavy artillery. If You Can Kill For Peace, Does That Mean You Can Hate For Love Also? Hope So. Or Else We're All Buggered. Whilst reading this issue a scene from a movie suddenly popped into my mind -- which in a very strange way kind of symbolised how I felt about it. It's from the original Peter Cook and Dudley More movie, 'Bedazzled '. Though why I thought of it in the first place is anybodies guess really. OK, so hopefully this is it. Next issue 'Everybody Verses Lafleeze' is what the closing caption states. Please lets this be the case, and that there isn't any more diversions along the way. As of yet I feel that this book has not been properly defined within the DCnU, and needs some sort of stability to firmly plant it as a title in own right. I don't want it to be refereed to as 'that other Lantern book', or 'Kyle and his gang'. The concept is good one, huh? It just needs a place to take root is all.